The lenses you prescribe to patients can address a variety of visual challenges, from driving to sporting needs and computer tasks. While you educate patients about the functions of their lenses, you may also want to educate them about the role a specialized lens can play in their style. You can set the stage for a more in-depth conversation with opticians, making it more likely for your optical team to capture the sale. A new style guide from Transitions makes this conversation easier, which means a greater number of patients purchasing adaptive lenses from you, and higher revenues. Transitions Optical reports a 94 percent retention rate and a customer satisfaction rate of 88 percent. Given this data, one could assume that for every patient who purchases Transitions lenses, they will continue to do so every year or two thereafter, for life. It takes less than five minutes to thoroughly explain the benefits of Transitions lenses, yet yields a return on investment of your time. 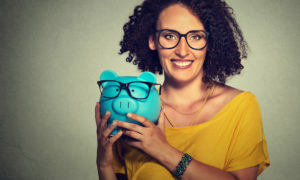 To put this into numbers, say you sell a Transitions lens at a hypothetical upgrade charge of $100 (Note: the price of Transitions lenses will vary according to the lens material, prescription and the Transitions brand lens product chosen). In this scenario, assume the patient falls in the aforementioned “satisfied/retention” group, meaning that they will continue to purchase glasses with Transitions lenses. If they purchase lenses annually, you can expect to earn an additional $100 each year they are a patient at your office. In the long run, this could yield an additional $1,000 in revenue every decade. And that’s just for upgrading one patient to a Transitions lens, excluding frame selection and all other lens materials or add-ons. If you apply this estimate to your entire patient base, you can see how lens upgrades can be a great source of additional revenue. Click HERE, or the image above, to download a copy of the Lens Style Guide from Transitions. It may not seem like your place as a doctor to discuss style, but patients won’t wear the glasses you’ve prescribed if they don’t like the way the lenses look. 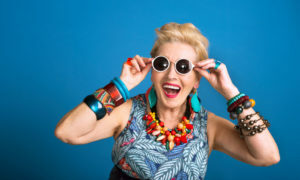 The most common misconception about Transitions lenses that I hear from patients is that only our grandparents wear them. This isn’t true at all! 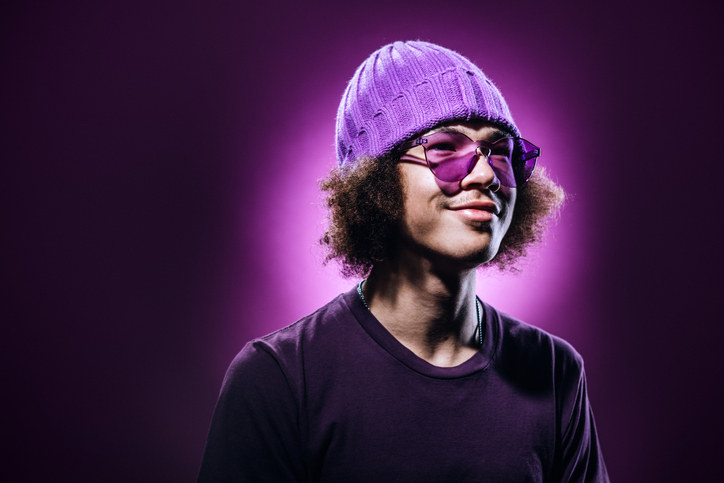 Transitions Optical has come a long way with their lens technology, and people of all ages wear them — even young, hip Millennials. 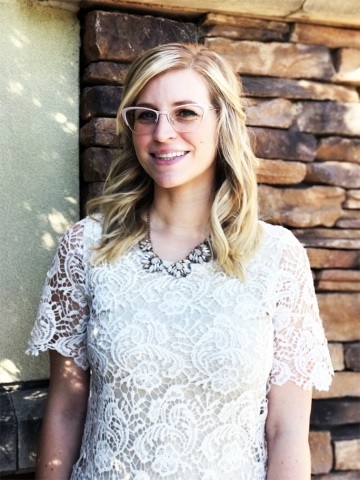 The Transitions Style Guide instructs you how to talk to your patients about the latest trends in eyewear, how to pair frames and lenses, and how to display eyewear in your practice. Since Transitions lenses are available in multiple color options, I explain to patients that they pair well with any frame to match their personal style – whether they’re going for a bold statement or a classic everyday look. I have downloaded the Style Guide on my exam room computer to quickly show patients new to photochromic lenses what Transitions lenses are all about. 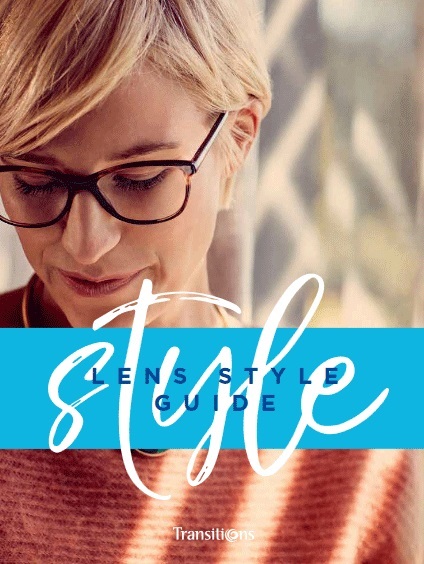 You can also print copies of the Style Guide to keep in your optical to use as a reference when patients are selecting frames and lens styles. Patients highly value a doctor’s recommendation; they want to hear from you which lenses and lens add-ons are best and why. Start the conversation in the exam room and finish it with the hand-off to an optician. Immediately after refraction I discuss the patient’s prescription and provide lens recommendations, including add-ons such as anti-reflective coating, blue light protection, UV protection, etc. It is important to educate the patient about why you are prescribing a certain lens or add-on; namely, how it will address their individual visual demands, occupation and lifestyle, as well as the protective benefits to ensure their lifelong eye health. The optical dispensary in Dr. Rights’ practice. She says desk mats advertising Transitions lenses remind patients of the different lens upgrades and styles available. For instance, I recommend Transitions lenses for tech-savvy Millennials because it helps to protect against blue light, and reduces glare, eye strain and ocular fatigue while working on digital devices. To verify that there haven’t been any communication gaps, I end this conversation by asking the patient if they have any questions about their prescription or my lens recommendations. When I perform the hand-off in the optical, I inform the optician of the lens and add-ons I discussed in the exam room. To the patient, this verbal repetition and instruction conveys the recommended prescription lens and add-ons as a necessity. I have found that once patients are educated and informed of the benefits of advanced lens technologies, they’re more likely to purchase the product. 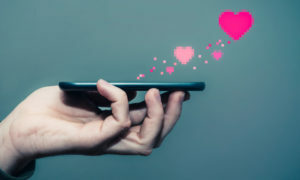 It’s tough to compete against the low-cost pricing of online retailers, but small businesses have a key advantage: a personalized buying experience. By understanding lens style, you have the opportunity to make a patient feel unique. Customize the experience by focusing on the patient’s personal style and visual needs. Pay attention to their hair color, skin tone and face shape. Take note of their personal style by observing their choice of shoes, clothes and accessories. Patients will perceive you as an expert in eyewear, which can help boost their confidence and improve purchase satisfaction. We keep small marketing displays scattered throughout the optical as subtle advertising. 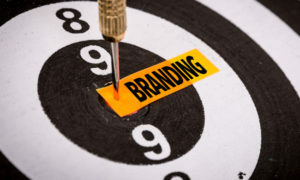 As people have a tendency to become overwhelmed and turned off by “in your face” advertising tactics, we prefer to keep it simple by only featuring the best products we offer. We keep the new Live the Good Light mat on our frame adjustment bar. 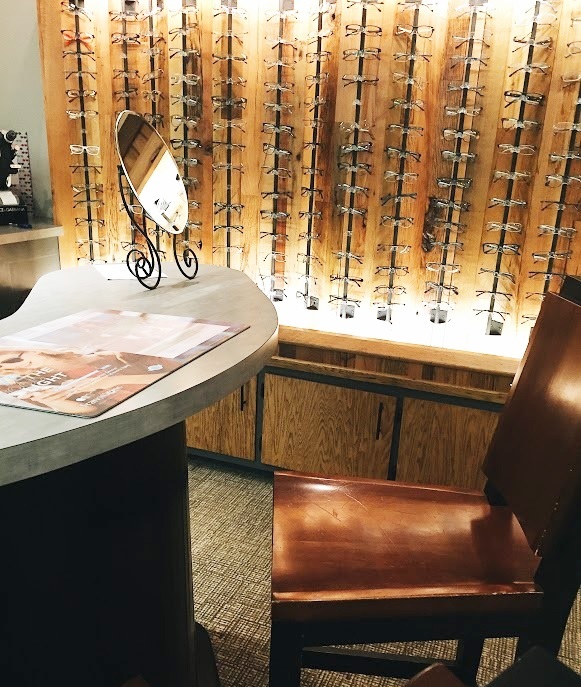 It illustrates the different Transitions lens styles, so when patients visit us to have their frames adjusted, or lenses cleaned, it’s right in front of them. We also use the Transitions lens card, which features four demo lenses: Transitions Signature (in gray, brown and graphite green) and Transitions XTRActive in gray. When patients are selecting Transitions lenses to pair with their frames, we show them these demo lenses to help them visualize their color options. You can request point-of-sale materials at TransitionsPro.com. The best form of advertisement is wearing the product yourself. Fashionable frames are a great conversation starter, and I always make sure to tell people which lenses I’m wearing, too. Most patients are surprised to learn that I personally wear Transitions lenses. This opens the door to discuss lens add-ons and their benefits, as well as dispel any misconceptions or myths they’ve heard about newer lens technologies.